A TV Show with some bite! EDITOR'S NOTE—Here's a daytime television show with some bite in it. 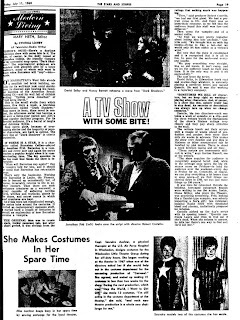 The bite, of course, is the daily repast of Barnabas Collins, the friendly vampire of the successful soap opera "Dark Shadows." The supernatural goings-on are hatched with ghoulish glee by a large audience, many of whom only want to know when Barnabas will "zap"—bite— again. ON MANHATTAN'S West Side stands a smallish red brick building, notable for its well-kept look amid shabbiness, its discreet sign bearing the familiar logotype of the American Broadcasting Co. — and its wall full of childish writing: "Debbie loves Jonathan" or "Gail loves David." This is the small studio from which comes, five days a week, a television phenomenon called "Dark Shadows." Soap opera in form, dime novel in content, the afternoon serial has become a hit over a three-year period and ABC's most popular daytime program. For its devoted audience, it's a barrel of laughs and delicious thrills. Soap opera plots, because of overlapping stories and the longevity of popular characters, are hard to outline. The story line of "Dark Shadows" is utterly impossible. 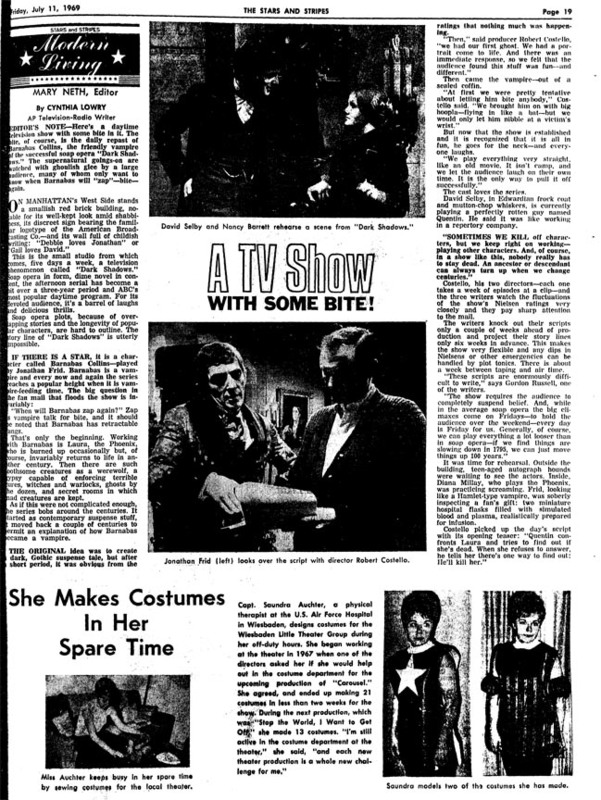 IF THERE IS A STAR, it is a character called Barnabas Collins—played by Jonathan Frid. Barnabas is a vampire and every now and again the series leaches a popular height when it is vampire-feeding time. The big question in fan mail that floods the show is invariably: "When will Barnabas zap again?" Zap is vampire talk for bite, and it should noted that Barnabas has retractable fangs. That's only the beginning. Working with Barnabas is Laura, the Phoenix, who is burned up occasionally but, of course, invariably returns to life in another century. Then there are such loathsome creatures as a werewolf, a gypsy capable of enforcing terrible cures, witches and warlocks, ghosts by the dozen, and secret rooms in which mad creatures are kept. As if this were not complicated enough, the series bobs around the centuries. It started as contemporary suspense stuff, moved back a couple of centuries to permit an explanation of how Barnabas Became a vampire. THE ORIGINAL idea was to create a dark, Gothic suspense tale, but after a short period, it was obvious from the ratings that nothing much was happening. "Then," said producer Robert Costello, "we had our first ghost. We had a portrait come to life. And there was an immediate response, so we felt that the audience found this stuff was fun -- and different." Then came the vampire—out of a sealed coffin. "At first we were pretty tentative about letting him bite anybody," Costello said. "We brought him on with big hoopla—flying in like a bat—but we would only let him nibble at a victim's wrist." But now that the show is established and it is recognized that it is all in fun, he goes for the neck—and everyone laughs. "We play everything very straight, like an old movie. It isn't camp, and we let the audience laugh on their own time. It is the only way to pull it off successfully." The cast loves the series. David Selby, in Edwardian frock coat and mutton-chop whiskers, is currently playing a perfectly rotten guy named Quentin. He said it was like working in a repertory company. "SOMETIMES WE KILL off characters, but we keep right on working, playing other characters. And, of course, in a show like this, nobody really has to stay dead. An ancestor or descendant can always turn up when we change centuries." Costello, his two directors—each one takes a week of episodes at a clip—and the three writers watch the fluctuations of the show's Nielsen ratings very closely and they pay sharp attention to the mail. The writers knock out their scripts only a couple of weeks ahead of production and project their story lines only six weeks in advance. This makes the show very flexible and any dips in Nielsens or other emergencies can be handled by plot tonics. There is about a week between taping and air time. "These scripts are enormously difficult to write," says Gordon Russell, one of the writers. "The show requires the audience to completely suspend belief. And, while in the average soap opera the big climaxes come on Fridays — to hold the audience over the weekend — every day is Friday for us. Generally, of course, we can play everything a lot looser than in soap opera—if we find things are slowing down in 1795, we can just move things up 100 years." It was time for rehearsal. Outside the building, teen-aged autograph hounds were waiting to see the actors. Inside, Diana Millay, who plays the Phoenix, was practicing screaming. Frid, looking like a Hamlet-type vampire, was soberly inspecting a fan's gift: two miniature hospital flasks filled with simulated blood and plasma, realistically prepared for infusion. Costello picked up the day's script with its opening teaser: "Quentin confronts Laura and tries to find out if she's dead. When she refuses to answer, he tells her there's one way to find out: He'll kill her."